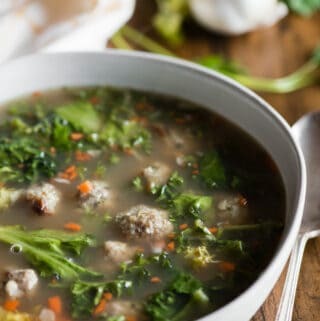 Italian Wedding Soup is a healthy and delicious easy to make homemade soup filled with flavorful small bite sized meatballs and tender green vegetables. 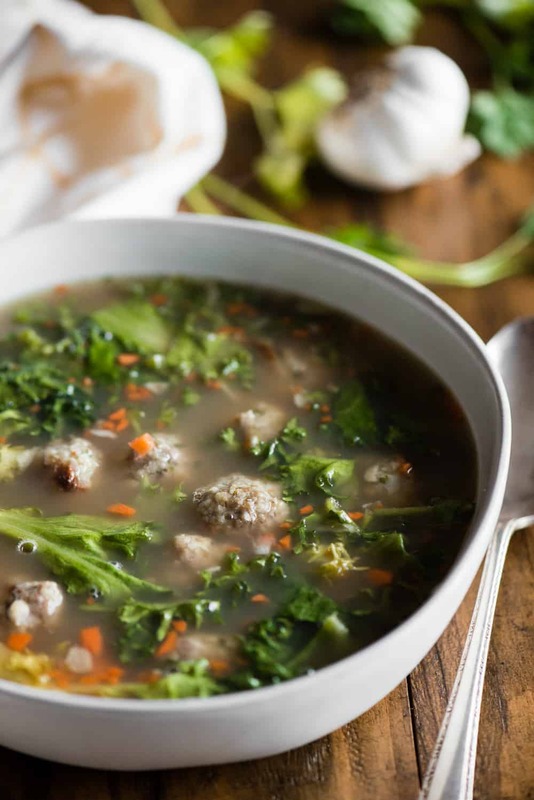 My version of Italian Wedding Soup has everything you could possibly want in a comforting soup. Protein, vitamins, fiber, and tons of flavor. The term “wedding soup” refers to the marriage, or combination of, meat and greens. There are so many variations of Italian Soup recipes out there, but the basic commonalities are that they all have some kind of meat and some kind of green. I suppose my Kale Soup with Italian Pork and White Beans could even qualify as an Italian Wedding soup. Minestra Maritata (Italian for wedding soup) is actually made and prepared in Italy. So, yes, once could say Italian wedding soup is actually Italian. But I’m sure my version of this recipe, along with the dozens of different Italian Wedding Soups served in restaurants and contained in cans at the store, vary significantly from authentic wedding soup served in Italy. Is my version of Italian Wedding Soup authentic? You’d probably have to ask a true Italian if my version would pass. As far as American tastes go, I’m pretty sure you can say that my soup tastes as authentic as what most people have eaten. Yes! My Italian Wedding Soup is a great soup recipe to freeze. 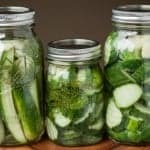 I always make an extra large batch so that I can store a few quarts in the freezer. Just be sure that you chill the soup in the refrigerator before freezing it. To reheat, you can either run some hot water around the outside of your container to release it and then reheat on the stove while still frozen, or you can fully thaw in the refrigerator before reheating. 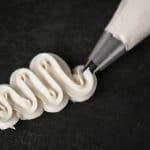 What does curly endive taste like? 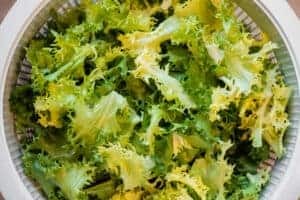 Curly endive isn’t one of the more popular green vegetables. I don’t know why – it tastes phenomenal in Italian wedding soup. Curly endive is bitter and a bit tough. For both those reasons, I love adding it to this soup. The bitterness in the greens is perfectly balanced with the saltiness of the broth and the heartiness of the meatballs. The fact that it’s a bit tough is perfect in a hot brothy soup because it gives you something to chew. I’ve seen Italian Soup Recipes with spinach. I am a true lover of spinach, but I don’t love it in soup because it is so tender, you’re left with nothing to chew. Curly endive is really one of the best vegetables you can add to this soup. When you do add it to the broth, don’t panic. At first it may seem like you added way too many greens to your soup and that they’ll never wilt, but they do. Does Italian Wedding Soup have pasta? Again, this is a matter of preference. I, personally, love pasta in this soup. I am very particular about pasta in my soup, though. If I’m going to put pasta in my soup, it’s going in the amount I plan on eating. Why? If you add pasta to soup and then store any leftovers in the fridge, the pasta will continue to expand and get mushy. My husband loves this, I do not. If you like mushy pasta in your soup, go ahead and add it and don’t worry about the leftovers. If you prefer your pasta to have a little bite to it, only add pasta to the amount you plan on eating. You can add any kind of pasta to Italian wedding soup, but I prefer teeny tiny little specs of pasta. There are two parts to making my Italian Wedding Soup Recipe: the meatballs and the soup. I’ve seen Italian Wedding Soup recipes where you combine raw meatballs with the hot broth to cook them. I did not want to do this for two reasons. First, I love meatballs that are brown and crispy on the outside. You won’t get this if you drop the raw meat into the broth. Second, I like to make my meatballs with ground pork and beef, but both release a fair amount of fat when cooked. I would rather pre-cook the meatballs in the oven and drain off the fat than to have all that fat dissolved in my soup. 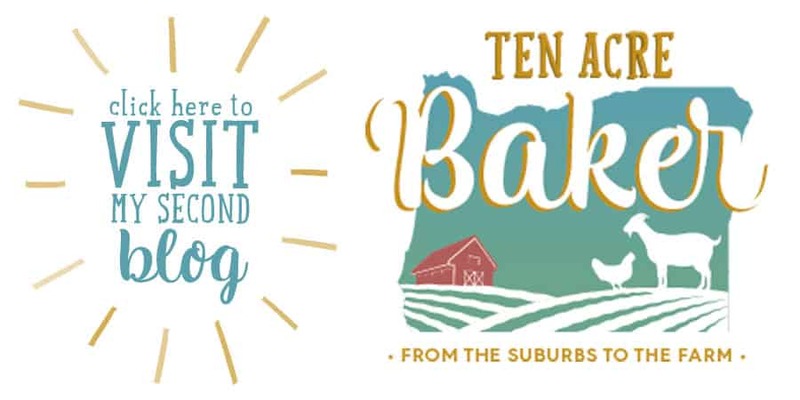 When you bake your meatballs, be sure to make them small and bite sized. These aren’t spaghetti meatballs. The smaller the meatball, the more work and time it will take, but the smaller the better. While the meatballs are cooking, you can get the broth heated. 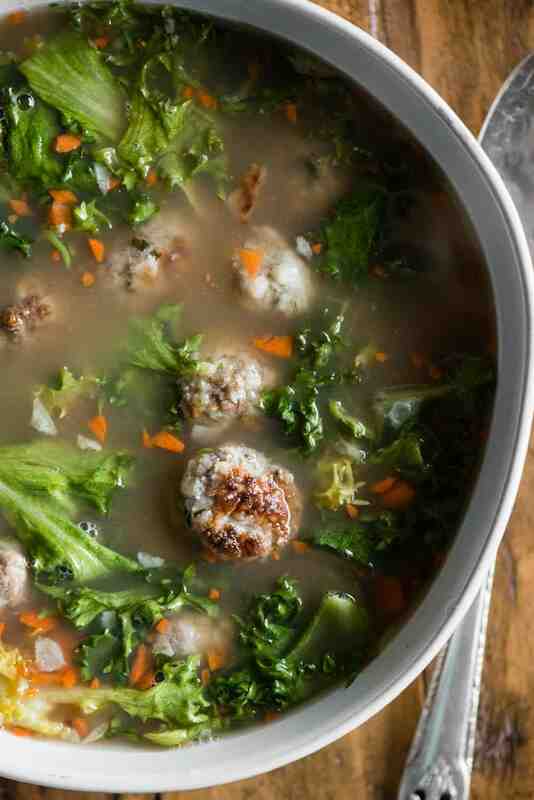 I like to add some white wine to this Italian Wedding Soup for flavor. Wine always makes everything taste better. I also like to add carrot for a little pop of flavor. 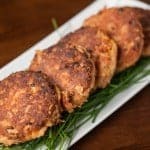 Cooking tip – use your food processor to dice up the onion, garlic, and parsley for the meatballs and then chop your carrot up in the food processor too. It makes little work with easy clean up and the result is a nice rustic uneven chopped carrot. To make the soup, simply add the cooked meatballs to the hot broth and it’s ready to serve when the curly endive has wilted. Add the pasta at the very end, if using. 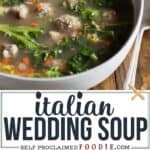 Is Italian Wedding Soup healthy? 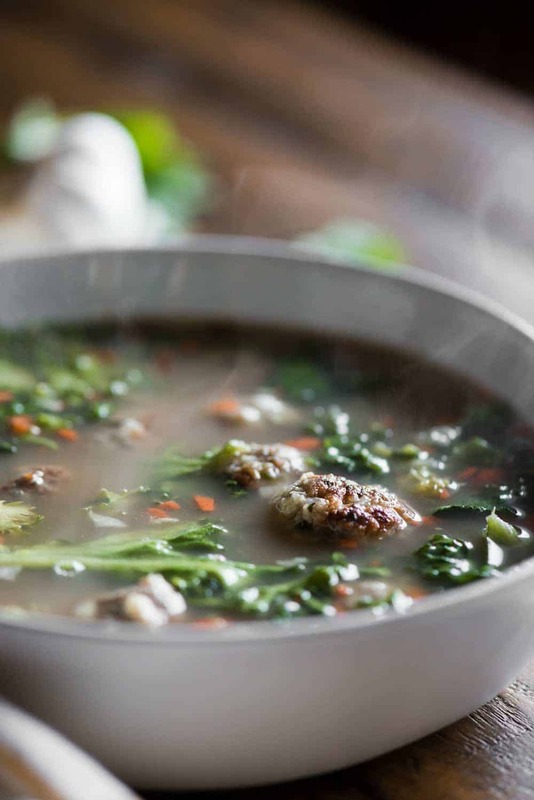 Considering I make my Italian Wedding Soup with pasture raised beef and pork, organic vegetables, and homemade chicken bone broth, I consider this recipe very healthy. It is, after all, filled with protein and vitamin rich foods with very low carbs (especially if you don’t add the pasta). 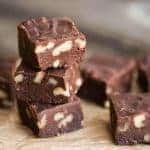 There are some people who might not consider this healthy because they consider beef and pork unhealthy and choose to use meat like ground turkey. That part is a matter of opinion. I also add panko bread crumbs and parmesan to the meatballs. Some people might say that disqualifies my Italian Wedding Soup as a healthy recipe. I disagree, however you can always substitute with gluten free non-dairy alternatives, if you prefer. Combine all of the meatball ingredients in a large bowl and use hands to combine. Make sure all of the ingredients are thoroughly mixed but try to avoid over working the meat. Use a small cookie scoop or a teaspoon to measure small meatballs and roll them into a ball shape. 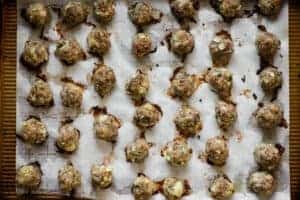 Fill the baking sheet with the formed meatballs. You can get them close but be sure that they aren't touching. You may have to make the meatballs in two batches. Bake in preheated oven for 10 minutes. Change heat to broil and cook for an additional 5 minutes. They will most likely be fully cooked, but if not they will finish cooking in the soup. You just want to give them a nice brown on the outside and melt away some of the fat. Transfer meatballs to a paper towel lined plate to allow some of the grease to drain off. Heat the broth, wine, carrot, endive, and salt in a large pot over medium high heat. Add the meatballs. Reduce heat as needed to maintain a gentle simmer. Cook until the endive wilts, about 20 minutes. If using pasta, add to soup about 5 minutes before you're ready to serve. Keep in mind that if you'll have leftovers, the pasta will continue to expand which may or may not be your preference. Nutritional info is based on the soup NOT having the pasta.